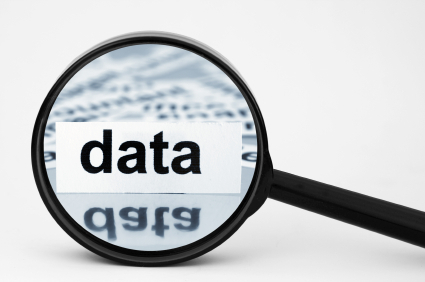 Do you use Facebook apps to collect data from prospects? Do you understand the pitfalls? This article will explore the ins and outs of Facebook permissions and reveal five key points marketers need to keep in mind. 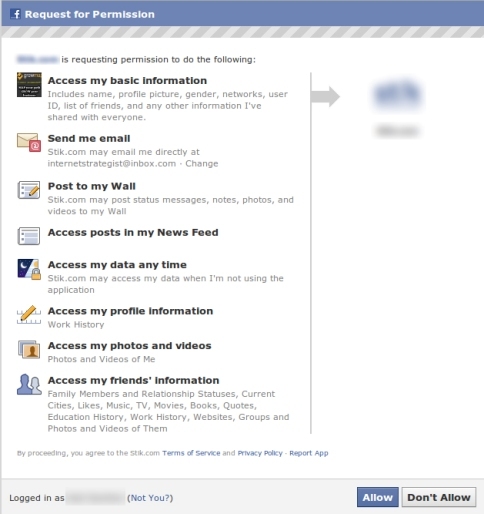 So What Exactly Are Facebook Permissions? Facebook Permissions are a Facebook feature that allows the social network and businesses that use Facebook for marketing purposes to collect information about users. When a user agrees to “allow” Facebook, or a business, to broadcast a user’s Likes or other information, the user has granted Facebook permission to do so. 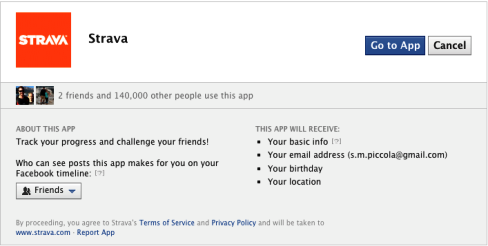 By the way, Facebook Permissions are not only on custom apps. Any time that you connect to Facebook from an outside website—such as Strava, a fitness training site—you’re giving that website permission to access your basic information on Facebook. Strava is a fitness-tracking website that allows users to use a GPS device to track activity, then view the activity on the Strava website. Strava allows users to sign up using Facebook, and users are prompted with Facebook Permissions they must accept to sign up. With each data field a business asks for online, the opt-in rate drops by 10% (I heard this from a Facebook product engineer). That means if gaining access to your app requires customers to tell you anything at all, you could lose 10% of your potential users right off the bat. Ask for an email address and lose 10%. Ask for a birthday and you lose another 10%. Ask to access their friend list and another 10% are gone. The quick math here? Ask for five pieces of data and you could lose half of the people (or more) who are at least interested enough in your business or brand to check out your page and your app(s). These facts are not only relevant to developers who are creating the apps: they matter to any business owner who wants to collect information about users via Facebook apps, including contests and promotions. Collecting data from users is a key reason that businesses run Facebook contests and promotions. 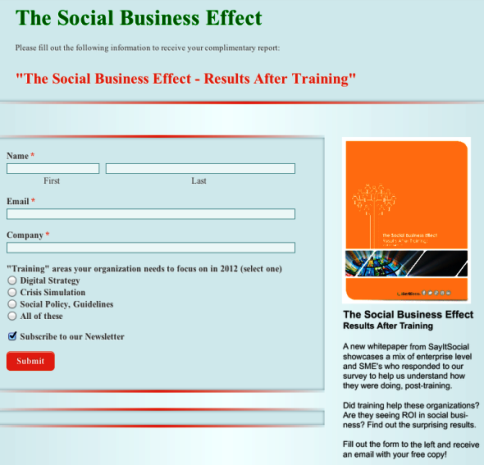 Data collected can be used for later marketing outreach. Image source: iStockPhoto. Today, social media is being used for customer research on a daily basis. However, with all of the news about privacy, identity theft, hacking and in-boxes being filled with unwanted email, it’s no wonder that Facebook users abandon forms on custom apps when they ask for an exceptional amount of personal information. Unfortunately, some of the data that the business owners try to collect is marketing-driven and has nothing to do with the app. So it’s not surprising that none of the discussions are favorable: consumers don’t like it when a brand asks them for personal data, especially when the user can’t see how it will be used. With that said, marketers and business owners on Facebook are still able to gather information from their users and avoid these abandonment rates. While researching this topic, I discovered that there’s a lot of information about how consumers can protect their privacy, but next to none about what businesses need to know about this issue. I believe it is a two-way street. If more marketers were careful about how they collect data, consumers would be more comfortable sharing the information that is the most helpful for businesses. To collect any data from users, outside of what is available via Facebook Insights, businesses must use a third-party provider to create a custom app. It’s here that Facebook Permissions come into play and businesses can make sure to choose a third-party app that allows them to customize the permissions, turning off access to data that they don’t really need. So in that spirit, here are 5 things marketers need to know about Facebook Permissions and asking for customer data. In most cases, knowing a customer’s or prospect’s name, gender and email address might be all you really need. Don’t ask for their home address, marital status, birthday and so on unless you’re asking them to sign up for your birthday club and want to give them a coupon for a free sample at a neighborhood restaurant. If you simply must have more than the basics, incentivize it. For example, give them access to your monthly email newsletter if they also give you a home address. The more permissions an app asks for, the bigger and better the incentive needs to be. Let’s say you really want 12 bits of data from your customers, but would be satisfied with five. When you ask for their data, make the first 5 fields required and then the next 7 optional. The last thing you want to do is lose the valuable information you could be getting from those first 5 fields. Who knows, they might give you 10 out of 12. That’s a lot better than nothing at all. This app asks for information beyond the basic name and address fields, but some of that additional information is optional, which increases the likelihood that users will enter. 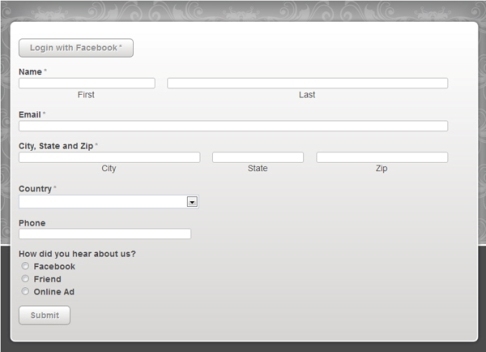 Some users may even fill out the optional fields. 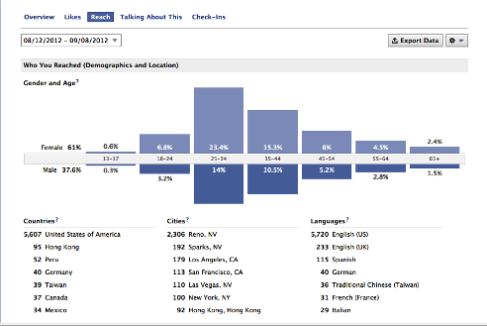 There’s a lot of information you can use for your marketing efforts that’s already available on Facebook Insights. You can learn the gender, age and location (cities and countries) of your fans or Likes. And you don’t have to ask them explicitly for this information. Facebook Insights gives page admins a good overview of their fan base without ever having to serve an Allow prompt or use a form to collect data. Enthusiastic fans of a brand or business will willingly give up all sorts of data if they believe that what they’re getting in return is appealing. Maybe you offer a great prize, or offer a coupon for free shipping, or give access to a new ebook that you just wrote. If your customers value what you have to give/sell, they’ll give you what you value in return. Don’t present them with a big form to fill out and offer nothing in return. Not many people have that much free time. In the image below, Say It Social is offering a complimentary white paper to fans so they make sure to ask for relevant information pertaining to the what they’re offering. Say It Social is making it worthwhile for their fans. I hear all the time from businesses who use apps with a Facebook Permissions prompt that they do so to “save the customer time.” But in many cases, all you do when you use the Permissions prompt is make your potential users click away from your app. You already know your users’ gender, age, location, Likes, interests, friends, etc. It’s up to you to decide how much value there is in collecting information beyond that. Remember that if a user is not willing to fill out the most basic information—i.e., name and email address—he or she wouldn’t have come to your page in the first place. You see how slippery the slope gets? You don’t really want to save your customers time, you want to market to them and their friends. Savvy marketers may truly need this data for advanced apps, but they should also know how to use it correctly and not abuse it. When you collect only the information the user gives voluntarily, this can lead to more users of your app. The more permissions an application asks for, the more users will click Cancel. Remember that whenever you ask customers to authorize an app, you’re asking them to grant you certain permissions, also known as access to their personal data. This is asking for a lot of trust, so don’t abuse it. Only serve your customers a permissions prompt if you really need to, and be cautious not to push them so far that they give you nothing at all.